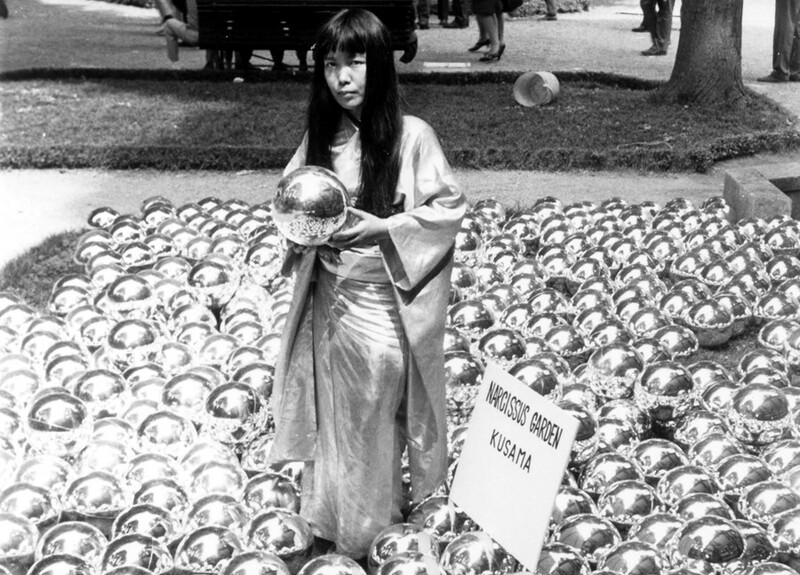 In 1966, in response to not being invited to the 33rd Venice Biennale, Japanese performance artist Yayoi Kusama littered 1,500 plastic-metallic balls on the lawn of the pavilion at the 33rd Venice Biennale. Alongside the balls, the artist installed two yard signs, one stating “Narcissus Garden, Kusama”, and the other “Your Narcissism for Sale”, as she stood among them, barefoot draped in a gold kimono. In direct reference to Greek mythology’s story of Narcissus, the installation was aimed at critiquing art world consumerism, as the art world was literally forced to confront their own vanity. This was Kusama’s first successful experimentation with performance art, it was one indicative of the radical career that was soon to follow. Since it was first displayed, “Narcissus Garden” (1966-2018) has been recreated multiple times, each new installation becoming more and more elaborate. Now, the installation is coming to New York, with its 2018 recreation focused on using the balls to reflect on America’s militaristic history. In collaboration with MoMA PS1 and as part of their free public art festival, Rockaway!, “Narcissus Garden” will be on show at Fort Tilden, New York from July 1 – September 3. Rockaway! 2018: Narcissus Garden by Yayoi Kusama will enable viewers to reflect on the industrialisation of the Fort Tilden area which was a former US military base.